Hey, Bud! You’re Crowding the Shot! It’s just another Saturday night at the homestead! I decided it’s been a while since I photographed the Brown Ripple Afghan, so I thought I’d do an update. Sir Goofnut, aka my 6-year-old son, decided that he needed to get in on the action. I laid the blanket out on the floor last weekend, and the consensus was that it was about half done. Sigh. I might make it a wee bit smaller, because I am anxious for Miss Z. to receive it. So I’ve been knitting a lot this weekend, trying to catch up. Unfortunately I am on the stripe that is from one of my lesser favorite yarns in the blanket, in that it is so much slipperier than the others. Thankfully that stripe is almost done. So I’ve been knitting and listening to podcasts this weekend. The weather is good for it; it’s the end of March but temps were still below freezing this morning. Last night I listened to Kelley Petkun interview Janet Szabo on the Knit Picks Podcast. Then tonight, I was thrilled to learn that there is a new episode of Cast On available, and guess what??!!?? It’s all about HATS! Hats are my most favorite thing in the world to knit. 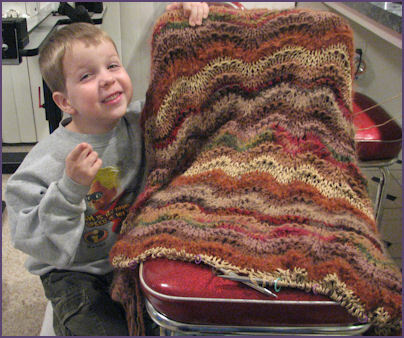 In fact, I can’t wait to get done with this blanket so I can knit one! It’s been too long. Anyway, back to the pointy sticks! It’s a great night, indeed. So I couldn’t help it. I had to take a sanity break from my big brown afghan. 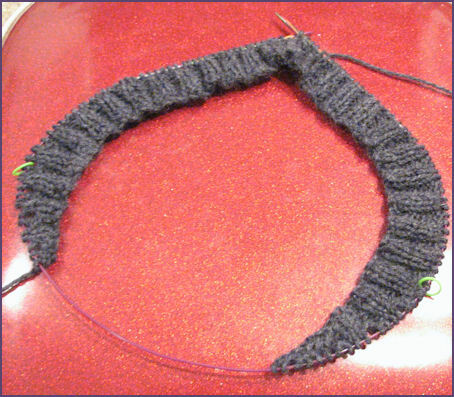 I decided to cast on for a Calorimetry headband, just to give myself something new to stare at for a day or two. Now I know why so many people have made them. They’re a quick knit, and as soon as you figure out what’s happening with the short rows, it’s very easy to do. I tend to go a long time between haircuts and my bangs are always in my eyes. I have trouble with traditional plastic hair bands like you can buy in drug stores and accessory shops, because they’re always a smidge too small for my fat head and they squeeze my brain and give me a headache. Regular stretchy cloth ones are also no good if they’re equally thick all the way around, because they won’t stay secured at the back and bottom of my head. So the short row design of this one seems like just the thing. I’m doing this one as written so I can see how close I came to getting the size right, but then my very next one will be an in the round version with no finishing, once I’ve figured out the sizing. These can get addictive! Must finish and get back to the blanket. I got a little surprise today! Knitty.com, in this issue’s Yosemite pattern, linked back to my tutorial on Magic Loop. How cool is that?? Many thanks to the pattern author. 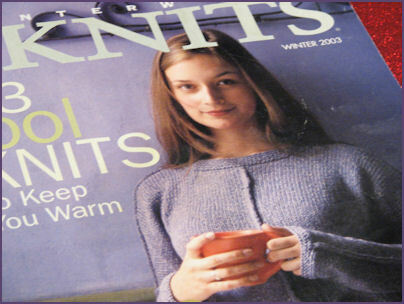 Unfortunately, the way I found out about it was that one of those knitting spam sites had confiscated the contents of this issue of Knitty, which then caused a pingback notice to me. This particular site was in French, except for the content that was cut and pasted from Knitty. Guess I’ll be notifying the editors so they can take appropriate action. Of course, I hadn’t checked my Magic Loop Page since before updating my layout a couple weeks ago, and some of the images were too large to fit properly, so I went quick and resized them. Hopefully all should be ok now. No news this week on the blanket, really. Still knitting away. Happy Easter to all who celebrate! 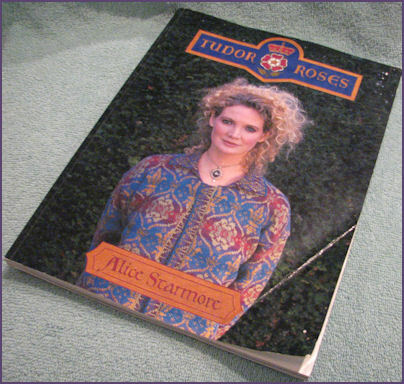 Ok, I’ve been trolling the interwebs for a little while now, on a quest for a couple of back issues of Interweave Knits. One of the ones high on my list has been Winter 2003, in which there are good articles about gloves and thumb gussets, as well as some comfy unisex slipper sock things. I actually lost this one the other day, but the seller wrote to me and said she had more than one copy, so I jumped on it. The magazine is great, the patterns and articles are just what I wanted. But it STINKS. In a big way. In the I’ve sprayed it with skanky car air freshener to hide the cigarette smoke kind of way. But this is a good issue, and I can’t stop looking. And my eyes are watering and I’m sniffly. Oh well, the price I pay for my knitting addiction. Guess I’d better take a hit on the inhaler before bed. Which is where I’m headed now. I hear that Kelley Petkun interviewed Charlene Schurch for her podcast tonight. Given my suddenly renewed interest in socks, I can’t wait to listen as I head off to sleep.